Elettro produces feeders for cathodic protection since 1960; the series 5000 is our last product, easy to install, easy to use. These feeders are well-known for their robustness and reliability and for the quality of the components used. Four are the standard versions: 6A, 12A, 20A and 30A ; 0 ÷ 50Vdc. The components are mounted in order to facilitate the inside accessibility and the start-up procedures. A digital control instrument, potentiometers and push buttons, all on the front panel, make easy to set, regulate and read the output parameters. The access to the terminal board is accessible removing a part of the front panel only. The feeder can be set to function in direct current mode or in constant potential mode, with the option of supplying an adjustable basic current. 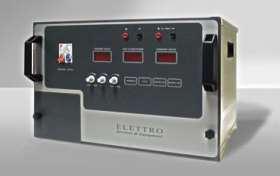 The Elettro cathodic protection feeders comply with electromagnetic and safety regulations. Single-phase diode rectifier (on control card), with automatic regulation to supply constant current or a constant potential differential. Control card, which manages the following signals: SH (output current), V (output voltage), d.d.p. (potential difference signal between electrode +E and pipe -C). Data entry keyboard, with pre setting device for constant current or constant potential and with potentiometers. Mains power switch (IR), output switch (IU) protection. Single-phase transformer (T) with primary voltage 230Va.c. and secondary with changing tap by means of voltage changer on terminal board transformer. Damages to the transformer or to the rectifier group by means of mains switch “IN” placed on front panel. Damages to the constant current output circuit by means of output switch “OUT” placed on front panel. Pipe connection cable breakage, by means of electronic monitoring. Output terminal short circuit. 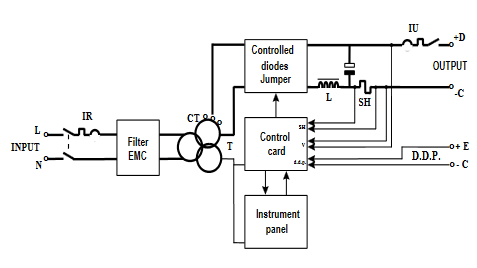 By means of electronic current limit the current will keep the calibrated value, with a maximum transient of 50 ms.